In an interview on BBC Radio Suffolk recently I was asked, rather sneakily I thought, which were the best - Norfolk churches or Suffolk churches? Without too much hesitation I hope, I observed that Norfolk had the best big churches, but Suffolk the prettiest small churches, which is true in a general kind of way, although it doesn't account for the likes of vast, wonderful Blythburgh in Suffolk, or the lovely little church at Horsey on the Broads, not to mention lots of others. I suppose that it is generally accepted that Suffolk is the prettier county, and its little churches are an adornment to its rolling landscape of fields and copses, but much of Norfolk is pretty too. But Norfolk is big, and places can become hidden. If Suffolk has the big skies, then Norfolk has the breadth of the land, breathtaking in its sweep across the vastness of England's fourth largest county. Norfolk is big enough to have regions - the Marshland, the Breckland, the Broads, and so on - and separating the Broads from the western part of north Norfolk is a belt of secretive woodland. I had become used to travelling through it on the way from Norwich to Aylsham, and had often seen the little handmade sign pointing down a way through the woods to a church. Welcome! it said. Open every day! But I was always on my way to somewhere else, and what I knew of Stratton Strawless church I knew from others - people who told me it was one of the most welcoming churches they'd visited, and the kind patient churchwarden who had contacted me by e-mail nearly two years before and asked me to visit. I had still not got around to doing so, but this was not for lack of interest. Indeed, what else I knew of Stratton Strawless came from books. 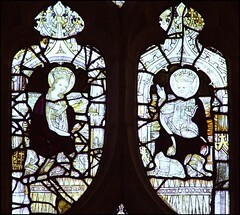 Here was a church with some excellent medieval stained glass, and two of the finest monuments in East Anglia. What was I waiting for? As it turned out, I was waiting for a beautiful day in mid-October 2008, when Mother Nature seemed to have forgotten that she was supposed to be getting on with autumn and putting Norfolk to bed, and instead had let the bright sun run riot in a cloudless sky. 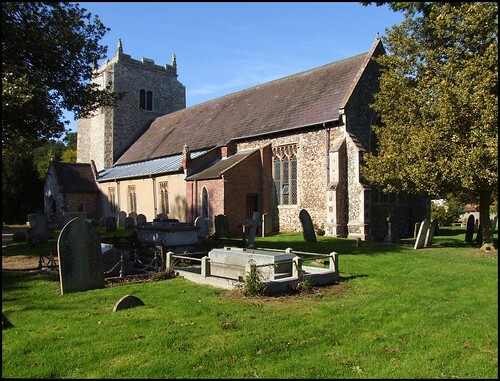 We had been to Ringland, undoubtedly the most important church yet to find a place on this website, and a succession of less well-known parishes to the north-east of Norwich with confusingly similar names to each other. Now we were heading through the woods, and not for the first time that day I felt a mounting anticipation. Stratton Strawless - Stratton meaning an enclosure by a Roman road, Strawless probably meaning exactly that, without straw - is about halfway between Norwich and Aylsham, but feels much more remote. We headed up on the back road from Hainford. The long lane narrowed, and then at a bend the hedges opened up, and there St Margaret was, a long, low church huddled beneath a squat tower in a narrow graveyard. The tower is clearly late Medieval, and was probably never finished. The east window tracery, of a century or so earlier, is beautiful. The little south aisle has elegant 17th Century details. We opened the gate, and wandered along the south side of the church. The sun gleamed on on the windows of what really is the tiniest of aisles. We felt the warmth of it on our backs, and it really did seem incredible that the year was almost over. The south door was wedged open, but we resisted going in. Instead, we wandered around to the tower, and there, to the west of the aisle, were the tombs and memorials of the family most strongly associated with this church, the Marshams. Strictly speaking, these ones are to their less significant members, because the famous ones are inside in the aisle, but it is a very picturesque little spot. Walking around to the north side, we found that the north door was also wedged open. Beyond the gloom inside we could see the fierce sunlight bursting through the open south doorway. Within thy little house of clay. Dyes too to keep her companie. In rich and Blessed Aeternitie. The aisle is not very wide, and so there is a sleight of hand about the way the sculptor has rendered them facing outwards at prayer - or, more accurately, a sleight of foot, because, as Sam Mortlock observes, the effect is of a family of amputees. Topping even this curiosity is the monument to Thomas Marsham, at the east end of the aisle. Thomas died in 1638, on the other side of the great Commonwealth divide, and while his memorial shows more evidence of Puritan influence, with its emphasis on death and judgement and the transitory nature of existence, it is also spectacular in its own way. Marsham lounges in his graveshroud on a comfy cushion, raising his head in response to the last trump being sounded above his head. Beneath him is the extraordinary prospect of a charnel cage, filled with his skull and bones, and those of his ancestors. It takes you a moment to realise that they are not in fact real, but finely carved from alabaster. You can see similar works at South Acre and Norwich St Andrew. Thomas Marsham's is the only reclining effigy that I have seen which has designer stubble. We know he had the memorial made before he died; did he perhaps think that his likeness looked too effeminate, and asked them to alter it? The most famous of the Stratton Strawless Marshams was Robert Marsham, whose life spanned all but a handful of the years of the 18th Century. He effectively invented the Science of Phenology, the practice of meticulously recording and predicting the passage and effects of the seasons. He was also responsible for planting the woodlands on the Marsham estate, which survive today. If the Marsham memorials were all there was to Stratton Strawless, it would still be worth going out of your way to visit, but there is much more. So far, we have not touched on the medieval life of this place, but here also in the south aisle is the 13th Century effigy of a woman wearing a wimple. She lies on her back, and the stone of the memorial is black. 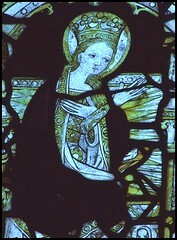 Not surprisingly, she is known as the Black Abbess, although this is certainly inaccurate, because she is holding a heart in her hand, which suggests that her husband died abroad, probably on a crusade. There is also a hint in the south aisle of Stratton Strawless's greatest treasure. 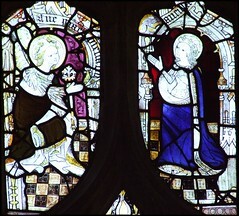 This is one of the best sequences of medieval glass in Noroflk. There are just fragments here; part of a Bishop, and an intriguing shield depicting a round-towered church, which is probably later and continental. 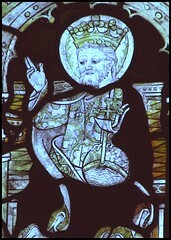 But the best of the glass here is in the nave. A long wooden screen spearates the aisle from the nave, so you must go back into the west of the church and enter behind the font to see it. It has all been reset in windows on the north side of the church - fortunately, the lack of a clerestory above the arcade on the south side meant that the strong aurumn sun did not stop us photographing it. There are survivals of four main subjects. 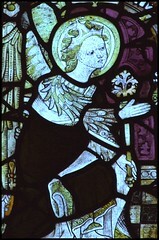 Firstly, the four evangelists,Matthew, Mark, Luke and John. It is unusual to find all four surviving from the same 15th Century set, and delightful to note that St Luke is depicted as a painter - traditionally, he painted the first icon, a portrait of the Blessed Virgin. Mark, Luke and John all have their mythical beast symbols seated at their feet. 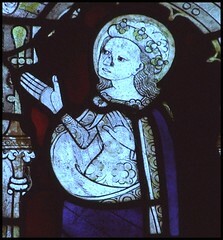 Secondly and thirdly, the Annunciation and the Coronation of the Blessed virgin. These two pairings, of Mary with the angel Gabriel, and then with her son crowning her the Queen of Heaven, must surely always have been intended to be seen together. 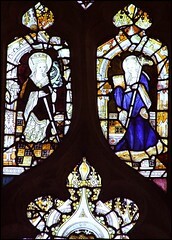 Lastly, just two female martyr Saints, St Margaret and St Catherine, looking similar to their counterparts at Salle. Presumably, there were once many more. A bit further east is Stratton Strawless's single most famous feature, the angel head. 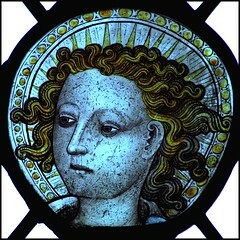 This is so perfect that it has appeared in many books as a fine example of 15th Century Norwich School glass. About ten years ago, it formed the centrepiece of an exhibition at the University of East Anglia, but it was felt too important to be returned to the church without a proper restoration of its setting. This took several years, but you see it today in all its glory. In front of it, and almost filling the little nave, is one of the county's largest chandeliers, said to be Russian in origin. Mortlock thought it was probably 17th or 18th century. Perhaps it arrived here from a Russian cathedral after the Revolution. Beyond, in the chancel, a lovely modern Blessed Virgin and child set in the clear glass beneath the Decorated tracery is the icing on the cake of this, one of the loveliest of all Norfolk church interiors. If Stratton Strawless were merely lovely, then that, of course, would be enough. That it is also of outstanding artistic and historical importance is a bonus. But there is even more to it than that, for this is certainly one of the most welcoming of all churches. I have already told you that we found both the north and south doors wedged open. In this, the tercentenary year of the birth of Robert Marsham, you might think this was simply because of the exhibition detailing his life, which had been set up in the nave. But this is always a church which is keen to welcome visitors. On a table in the south aisle is an electric kettle, teabags, coffee, squash and a bottle of fresh water, a tin of biscuits and cakes, second-hand books and locally made jam for sale, and notices making it clear quite how glad the parish is that you made the effort to pay them a visit. It is outstanding hospitality, and made me so glad that I had come here. I bought a jar of marmalade, and a quaint paperback copy of Evelyn Waugh's Put Out More Flags. Coming here by car, I didn't feel that I had earned the right to a cup of tea, but we put the money in the tin anyway, before setting off to Coltishall on the other side of the woods. Outside, on one of the Marsham tombs, a robin cocked his head and watched us as we left the south doorway. Off in the hedge, a blackbird piped ardently, if a little sadlly. He knew that the days were getting shorter, and that all too soon the trees would shed their leaves. Then the storms would come, and within a few short weeks East Anglia would be in the grip of an icy, sub-zero winter, the hardest for years. But until then the unexpected sun gladdened his heart, as it did mine.